What are the differences between a wack, Rating and Comment? A wack, a Rating and a Comment are different from one another but they've got an awfully tight relationship. If you’re just startin’ out, the following will help you get acquainted-fast-with how they also relate to each other. Quite simply, a wack is your experience-the one you’re postin’ on the Wacktrap site. That experience, or the experience of any other member, is known simply as a ‘wack.' You’ll first choose the most appropriate Category where your wack fits-then tell us how it occurred. Basically your wack is givin’ the world the lowdown on what happened, along with all the details. Your wack–and the wacks of all our members-are the core of the Wacktrap site. Members give your wack a Wack Rating on a ‘1-mallet’ to ‘5-mallet’ scale of greatness. Top wacks are destined for the limelight of the Wacktrap front page-for the whole world to see. We don’t choose ‘em, you do. Wacktrap members determine which wacks are the best of the best. That’s what those little mallets you'll see, found at the base of every wack, are all about. Those mallets may seem small. But they actually mean big, big things. They're markin' the destiny of how many millions view your wack if it gets promoted to our front page. We're keepin' it honest here, so only other Wacktrap members are able to rate your wack. You won't be able to rate your own. If enough Wacktrap users deem your wack worthy of ‘5-gavel’ ratings, you’re headed for the ultimate limelight: the Wacktrap front page. Wack Comments are what members are thinkin’ about your wack. It's what they've got to say. You’ll be accruin’ lots of wack Comments, and quickly. Especially when our members think your wack’s good, great or just plain controversial. You can't rate your own wack but you can Comment on it: Comments is the spot to be if you’ve left out some details, need to add info or update your wack. Any Wacktrap member can post a Comment at any time, just by scrolling to the base of any wack. Comments attached to the base remain viewable, so they'll always be in context. Your wack is permanent. Wack Ratings and Comments have also got some serious longevity: once Ratings or Comments occur, they're attached to your wack for its lifetime. How do I suggest a category? I can't find one that seems just right. Square peg in a round hole? If it’s not fittin’, we need to know. We’re here to make that square peg round. If you want your wack to be seen and heard, it's gotta be in the right Category. Wacktrap needs your help to make sure the best fit is available. If I'm featured on Wacktrap will everyone know who I am? Yes, but only in the best way. 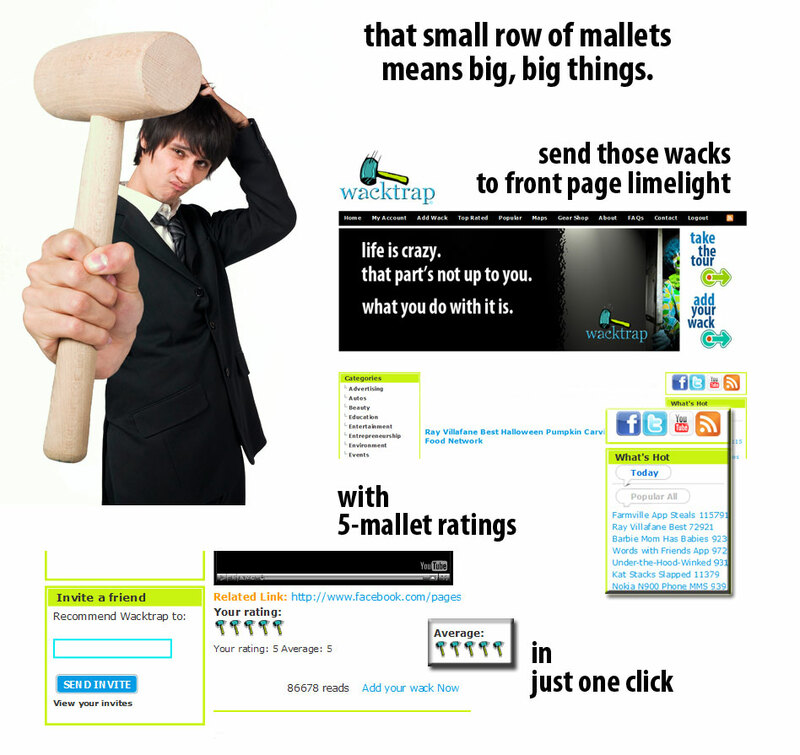 If your wack is promoted to the Wacktrap front page, your average 5-mallet ratings mean you’ve done a stellar job. You're guaranteed that Wacktrap members couldn’t agree more, since they’re the ones who put you there: front and center, on our wall o' fame. Can I add to my wack once it's been uploaded? Have something you want, or need, to add to your wack once it's already been created? Because your original wack can't be altered or edited once you hit 'Submit,' wack Comments is designed for that extra stuff you want to squeeze in, or feel like you just gotta say, after the fact. What can I add or attach to my wack? There’s just three main parts to any wack: the Category you select, its Title, and the body text of the wack itself. You're not going to be messin' with the Category, just selecting. If you can't find the Category that fits your wack, you've gotta let us know so we can fix it. How do I add my wack? You can add a wack from any page on the Wacktrap website. If you're ever feeling lost, remember: we always keep that Add Wack link at the ready. You'll find it in the top, main navigation menu, and it's not movin'. Adding a wack is easy stuff. We provide lots of options, but only three simple things are required: Category, Title, and your wack itself. How detailed should I make my wack? It’s your life, your experiences. So your wack will be as detailed as you deem worthy. As long or short as you like. Some days you may feel like writing a novel. Others, a novella. When it's more of a paragraph kinda day, just be sure to give us at least 10 words. The details are up to you.